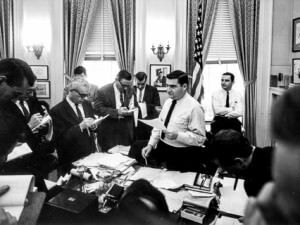 White House Press Secretary Pierre Salinger talking with reporters in his office on February 12, 1963. In this clip from the November 2 ExComm meeting, Kennedy instructs the group not to talk to reporters. He designated two people the press could talk to: National Security Adviser McGeorge Bundy and Special Counsel Ted Sorensen. In the section immediately preceding this, Kennedy complains about press speculation about Khrushchev’s second letter. “It would be a great disaster if we gave the impression the United States government was charging Khrushchev [unclear] unstable because I would think it would cause him intense annoyance,” Kennedy said. JFK [T]hese post-mortems are going to get worse and worse. We’ve just got to stop everybody talking to reporters except through the two sources that we agreed, which was [McGeorge] Bundy and Ted [Sorensen]. I wouldn’t talk to any—I mean, more and more now everybody’s trying to recapitulate everything and doing it in an inaccurate way. So I think we ought to try to really . . . Ambassador [Adlai] Stevenson sent a message of his conversation with U Thant, and within one hour and a half it was on the wire after we received it. So we’ve got to improve our procedures or we’re going to find ourselves in bad shape. Tape 47, Presidential Recordings Collection, President’s Office Files, John F. Kennedy Library. Excerpt from a transcript to published in David Coleman, ed., The Presidential Recordings: John F. Kennedy, volume 4 (New York: W.W. Norton, 2013).